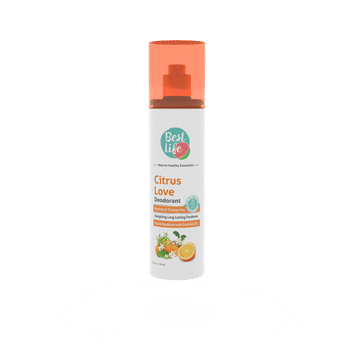 Stay fresh and vibrant with the all natural Best Life Citrus Love Deodorant infused with the the bright bergamot and zesty lemon essential oils. This fragrance is designed to protect you from unpleasant body-odour, providing you with a spirited, fresh experience. About the Brand:Best Life takes the concept of 'what goes on your body, goes in your body' very seriously. All ingredients that Best Life uses are rigorously researched, meeting international standards for efficacy, toxicology and environmental science. The products are fragranced using essential oils that are beneficial for hair and skin and are free from phthalates and other toxic chemicals, enhancing your overall well being. Explore the entire range of Deodorants/Roll-Ons available on Nykaa. Shop more Best Life products here.You can browse through the complete world of Best Life Deodorants/Roll-Ons .